When hearing situations prove most challenging, the POCKETALKER ULTRA delivers. Compact enough to bring anywhere, the POCKETALKER ULTRA is ideal for 1-on-1 conversations, TV listening, small groups, and much more. The POCKETALKER ULTRA includes a sensitive micro-phone that can be placed close to the sound source to minimize background noise, a compact amplifier with volume control, and your choice of headphones or earbuds to deliver full range, high quality sound. Two AAA batteries provide up to 200 hours of use, while rechargeable batteries and an AC Adaptor/Charger are also available. A microphone extension cord for TV listening, a belt clip case, and a handy carry case are standard components as well. 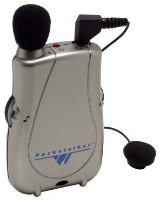 The POCKETALKER ULTRA is also used by doctors, lawyers, clergy, and other professionals when counseling hearing impaired persons. The POCKETALKER ULTRA meets ADA (Americans with Disabilities Act) regulations and is a convenient way to provide communication accessibility in public places and businesses. Sales and service personnel can use the POCKETALKER ULTRA for easier communication with hearing impaired customers or employees. At HearingPlanet, we're certain of the quality. That's why the POCKETALKER ULTRA amplifier comes with a manufacturer's 5-year warranty - your assurance of both quality and satisfaction.